Currently, overnight guests must pack up and leave every morning, an exodus that has led to neighborhood and business complaints. Portland soon will keep the Oxford Street Shelter open 24 hours a day, meaning homeless people who spend the night there won’t be forced onto the streets of downtown Portland each morning. Men and women who stay at the city-owned shelter must currently pack their belongings and leave by 7:45 a.m. 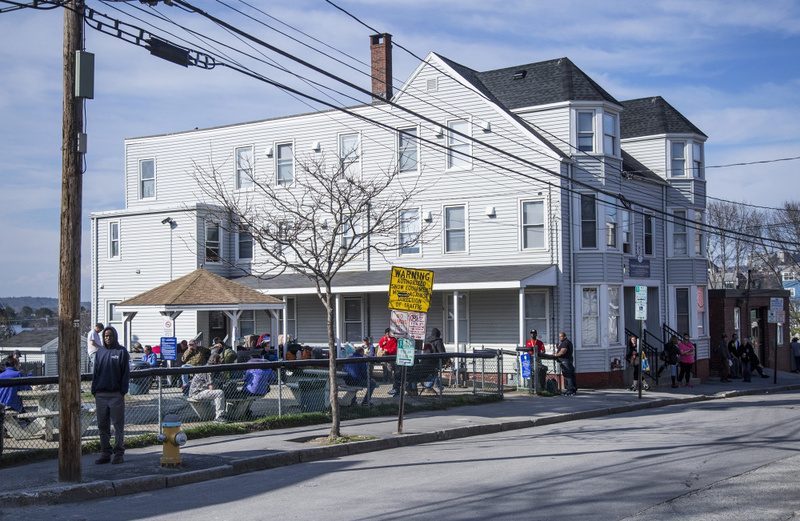 The exodus into the Bayside neighborhood has led to complaints from nearby residents and downtown business owners. Starting this fall, however, the shelter will be open around the clock. It will not provide meals, but guests will not be required to leave in the morning or line up outside in the evening. New lockers will be available to store personal items, and public restrooms will be added outside the building. Portland is still planning to build a modern one-story shelter with more on-site services for people facing homelessness. But City Manager Jon Jennings said he doesn’t want to wait two or more years to add a daytime refuge. The change also comes amid a surge of development in Bayside, a former industrial area that city officials hope to transform into a mixed-use and modern neighborhood. The Oxford Street Shelter has 154 beds and is open from 6 p.m. to 8 a.m. during the week and 1 p.m. to 8 a.m. on the weekends. It is not clear how soon the hours will change, but Portland Shelter Director Rob Parritt hopes to have the doors open during the day as soon as possible. Running the shelter during the day will cost more than $340,000 through the rest of the fiscal year. Jennings said the money will come from salary savings from vacant positions. The money will pay mostly for staff – five attendants, a security guard, a custodian, one human services counselor for supervision and another for community outreach. Typically, 10 people work at the shelter overnight; the day shelter will have six or seven employees on site. The shelter also will add a portable public restroom and a storage pod with lockers outside the existing building. More televisions, tables and a workstation with laptops will be added inside. Parritt wants to use the time during the day to connect guests with services by hosting seminars and inviting community partners into the shelter. The staff currently cleans the shelter while it is closed. When it is open 24 hours, Parritt said the maintenance crew will need to work while most guests go to the Preble Street Soup Kitchen for breakfast. Other operational details, like a new check-in system and policies for the lockers, need to be finalized. Stakeholders around Portland reacted favorably to the announcement Monday. Hirshon, who has lived in Bayside for 25 years, said he thinks fewer people will hang around the neighborhood when they have a place to go during the day. “It may make it easier to identify bad actors hanging around and preying on other people,” he said. The neighborhood has struggled with its high concentration of social service providers and homeless people. At the same time, developers have eyed Bayside for much-needed housing. Last month, the Portland City Council voted to sell four parcels of land in that area that will contain 100 units of housing and other commercial uses. Casey Gilbert, executive director of Portland Downtown, also praised the city’s decision to open the shelter during the day. At a forum in August, business owners said problems caused by aggressive panhandlers, mentally ill people and individuals under the influence of drugs or alcohol in the downtown have reached a crisis level. “Mr. Jennings has shown tremendous leadership and no doubt has had to make some difficult budgetary decisions, but with the support of his incredible staff and an engaged council, we truly feel that these policy changes are going to deliver visible positive outcomes, both for the shelter guests and for the community,” Gilbert wrote in an email. Mark Swann, executive director of the social services agency Preble Street, said forcing homeless people out the door in the morning only adds to the stress of their situation. Operating a shelter 24 hours a day is considered the best practice nationally. “I think this is a great first step for the city to be taking responsibility for the 24-hour shelter model that they’ve been talking about for a while now,” Swann said. While the number of homeless people in Portland has increased since the 1980s, other nonprofit shelters have struggled financially and closed. As a result, Swann said both the resource center at Preble Street and the overnight shelter at Oxford Street are overcrowded. He will be working with city officials to make sure services aren’t unnecessarily duplicated at the day shelter, but he said he hopes it can help with those capacity issues. Portland still plans to replace the existing Oxford Street Shelter. The city currently rents the three-story building for more than $150,000 annually. Portland officials have said it is unsafe for staff and shelter guests, and they have been researching options for a new building for more than a year. City Councilor Belinda Ray, who oversees the Health and Human Services Committee, said extending the hours at the Oxford Street Shelter will address some of the concerns in the neighborhood and improve conditions for guests. But she stressed that this is not a long-term solution. “It’s still not going to be the facility we need it to be,” Ray said. She said these changes – daytime space, lockers for personal storage, public bathrooms – all will be integrated into the new shelter. The Health and Human Services Committee will discuss the plan for a new shelter at its meeting at 5:30 p.m. Tuesday.